In an effort to be more organised this week I ordered my vegetables online. I thought it would save me some time, and give me time to actually cook some meals ahead. However, when I thought I had ordered 2 red onions I actually ordered 2 kilos! Now I already have brown onions in the cupboard and just wanted some red ones for salad. So then I spent maybe half an hour trawling through my cookbooks looking for a recipe to use these onions. Finally I found one for onion confit, at least two hours after that I had 2 cups of the finished product. So my little time saving idea turned out not to save that much time at all, and no I haven’t had a chance to cook up any meals for the week ahead. But, I did get to tackle a new recipe this month (see everyday inspiration) so I have at least accomplished something on my list. So what does one do when life gives you onions? 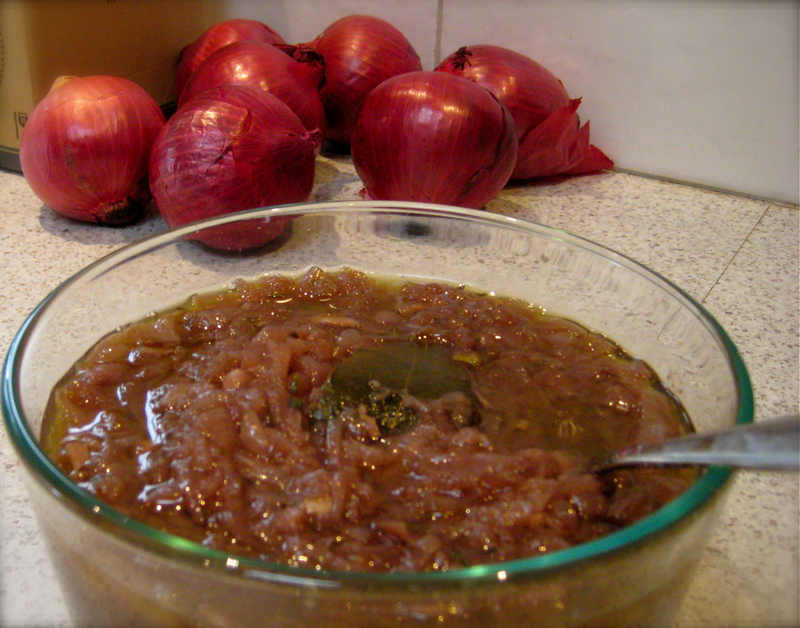 … make onion confit. Even if it’s not on the list!